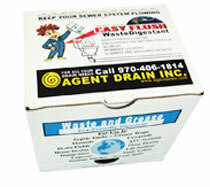 Waste Digestant « Agent Drain Inc.
Over time waste builds up in your drain lines and septic tank. Our special blend of bacteria help to reduce this waste. Our natural digesting micro-organisms will not harm your plumbing or septic system like chemical drain openers can. Our Waste Digestant helps to replenish the natural bacteria needed to keep your septic system in balance. Each annual supply contains 12 pre-measured packets, 12 calendar reminder stickers and a reorder card. Our packets have been professionally designed to be a clean and convenient method to treat your septic system. Each packet comes with the directions printed right on them. One packet per month will treat up to a 1,200 gallon septic system. 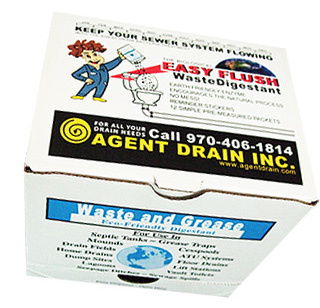 Agent Drain’s Easy Flush Waste Digestant can also be used to treat Conventional, ATU, Cesspool, and Mound Septic Systems, to treat drain fields aka leech fields, home drains, seepage ditches, lagoons and lift stations. Each packet contains billions of highly specialized strains of bacteria to digest proteins, grease, oil, fats, pectins, gums, papers, fibers, and starches. Plus our formula contains proprietary ingredients to help with the complete waste biodegradation process. Continue to keep the environment safe by using our special blend regularly.